This book helps you discover the secrets of this fresh, fragrant and delicate food, with its South-east Asian and French fusion. You can explore the rivers and deltas of Vietnam, the bustling markets of Saigon and Hanoi, and the celebrations and rich traditions that pervade everyday life. You can enjoy classic street food, such as Singapore noodles and Vietnamese spring rolls, delicious main dishes such as Saigon shellfish curry, or one of the sumptuous sweets, such as coconut sorbet or Vietnamese fried bananas. Vietnamese cuisine is one of the jewels of South-east Asia, with a style of cooking that is a wonderful blend of Chinese and Asian ingredients and the traditions of classic French food. 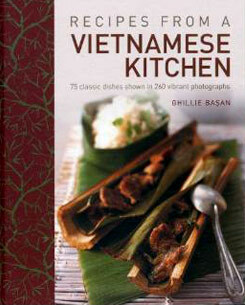 With more than 75 authentic recipes – from the national beef noodle soup, pho, which is eaten morning, noon and night, to pork pate spread on warm baguettes and drizzled with nuoc cham – this book gives you the opportunity to recreate a taste of Vietnam in your own kitchen. Make classic street food or sophisticated main meals, or try any one of the delectable sweet snacks that are enjoyed throughout Vietnam. This beautifully written, stunningly photographed book captures the real taste of Vietnam, and is irresistible for anyone who loves good food.